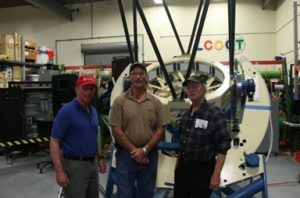 Having recently visited UCSB’s Sedgewick Reserve at the foothills of Figueroa Mountain in the Santa Ynez Valley, I was eager to learn more about the organization, people, and equipment comprising the Las Cumbres Observatory Global Telescope Network, commonly shortened to LCOGT Network or simply LCO. LCO’s very first fully automated research telescope was installed in the Laurie Nelle Bryne Observatory on a low ridge in the Sedgewick Reserve. While most of the research conducted at the reserve is related to botanical, zoological, and environmental subjects, what goes on with the state-of-the-art equipment in the Bryne Observatory is concerned with matters a bit more distant. Light years distant. least. Friday, June 30, 2017 commemorated the 109th anniversary of the Tunguska event which is believed to have been caused by a 150 meter object entering the atmosphere over a remote part of Siberia, vaporizing in an airburst explosion with an equivalent force estimated at 5 to 15 Megatons of TNT (or something like 310 to 935 Hiroshima atomic bombs). The resultant shock wave flattened 800 square miles of forest. Arriving in Goleta on a beautiful blue sky afternoon, we found the atmosphere at the LCO headquarters Open House decidedly quieter, relaxed, festive, and informative. All the trees were upright. Visitors were cordially greeted by the staff, and we were free to explore the facility, admiring the well-equipped machine shop, benches loaded with high tech electronics, 40 cm and 1-meter Ritchey-Chretien design telescopes, and even hefty chunks of nickel-iron meteorites recovered from Australia and Canada. We were treated to a bounty of refreshments and had ample opportunity to interact with LCO astronomers and engineers. LCOGT Network President and Observatory Director Dr. Todd Boroson addressed the large assemblage of visitors, briefly explaining the history and mission of LCO. 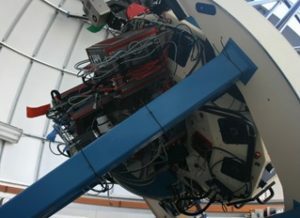 Founded in 2005, the non-profit Las Cumbres Observatory was conceived to be a unique fully autonomous worldwide network of state-of-the-art robotic telescopes, cameras, and spectrographs giving scientists the ability to perform continuous long term observing of astronomical phenomena as the network of scopes always has instruments operating on the night side of Earth. This model for networked continuous observing managed by an autonomously controlled system for scheduling, observing, and data reduction gives LCO a competitive edge in what the LCO scientists refer to as Time Domain Astronomy. Long term data collection on the world’s newest and largest telescopes is prohibitively expensive and it is simply not realistic to expect most astronomers will ever be allowed large swaths of observing time on them. LCO provides astronomers, agencies, and institutions more options and more availability to accommodate their long term research at a reasonable cost. e and inventory of NEO’s. Other research being conducted by LCO astronomers and scientists at other institutions include a wide range of subjects such as time sensitive Supernovae observation, exoplanet detection by both the radial velocity and transit methods, and searching for optical counterparts to newly discovered gravitational waves. There is even one researcher at UCSB who is proposing SETI work with the LCO Network of telescopes. A plethora of research papers on dozens of other subjects have been published by researchers from around the globe who utilized the LCO Network of telescopes to conduct their research. 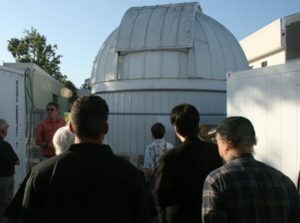 It was extremely fascinating to learn about the people, equipment, and work being conducted with the innovative technologies and approach to modern astronomical research that characterizes Las Cumbres Observatory, and it was very cool to know that it’s all happening right here in our backyard on the Central Coast.